spell it out to them. Because if the Visa Sextant was anything, it was FUN. Take that Linda. Not that we’re likely to see a C3 Sextant any time soon, Citroën being a little too self aware for that sort of thing nowadays. But in March 1980, a Sextant could have been yours for 31,900 francs, although it remains unclear if Captain Haddock was included in the asking price. Only 2000 Sextants were made, making them prized artefacts today. Wow, that’s a special edition I’ve never heard of. Probably didn’t make it to inlands like the one I’m living in. Note how wonderfully unaligned the blue decor is with regard to the rear window line. And why is the resulting arrow pointing backwards? On the plus side, the view on the upper photo carries with it a hint of the Ami6’s Z-line, which made me smile. And blue bumpers are cool. Isn´t in nice the way the body looks as if its floating over the wheels. I also noticed this with the Renault 11 we had on the other day. You get a different impression than today´s cars which look as if the body is mashed down on top of the axles, what with all those flared wheel arch cut outs. The graphics on this car are pretty bad, no? I imagine this is a prize collectors´s car and possiby a candidate for the Top 50 if only Sean had bothered to tell me about it when I was researching in the British Library and the Library of Congress all throughout the autumn months. Well, my list is nearly finished now. Just number 5 and number 1 to do. I deliberately avoided mentioning it since I am in the process of collecting all the surviving Sextants with a view to securng a monopoly on this collector’s gem that will doubtless appreciate in price. At present I have 3 sacks full of crumbling oxide and, already, I’m getting enquiries from the Far East. That floating effect is very nicely done on the Citroën CX – and it’s one of the main reasons I like this car’s shape so much. It’s best seen in an unadorned series 1 car (i.e. without those stainless steel “silly sills”) in a light colour. The 80ies and early nineties were a decade full of nice special editions from Citroen and Peugeot – i remember the BX Digit for example or the 205 Griffe. I bought myself a Citroen AX Image in 1991 – i could not resist its wonderful black velours seats. Modern special editions are mostly only a little cheaper package of equipment – and do not have a special colour, special interior trims or exclusive details. I know, DS offers the possibility of ultra-personalisation – nice. But that is not the same. (Because i want a special edition of a Cactus or a C1 – not of a DS4). Yes, a series 1 Visa is definitely on my wish list. Preferably in that apple green you show here – and with a 2-cylinder engine, not that bland inline Peugeot stuff. Painted white wheels with proper screw-on hubcaps too! That’s a very fine interior. I know it’s cheap. It’s also brave and original and functional. Interesting how, at the time, the Visa seemed to be a rather disappointing step away from the eccentric functionality of the 2CV (satellite controls excepted). 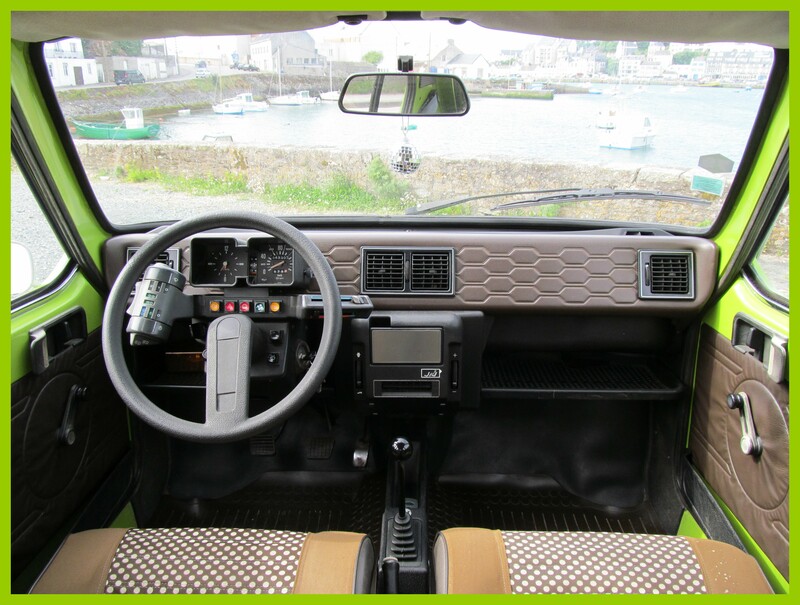 Now, looking at those pictures of the lime one, it has so much more in common (in a positive way) with its 2CV based predecessors than with the C3 – not that I can visualise a C3 interior without googling. The dashboard is so minimal – this car uses concepts we’d call modern if we ever saw them today. It’s thematically similar to that of the Renault 5 but just that bit more sophisticated. Notice the smart colour choices and smart use of texture. The interior says “transport” in a good way. It’s the car equivalent of a sandal.